From afar, the rocks look like walls that protect this island-municipality from the ferocious waves of the Pacific Ocean. 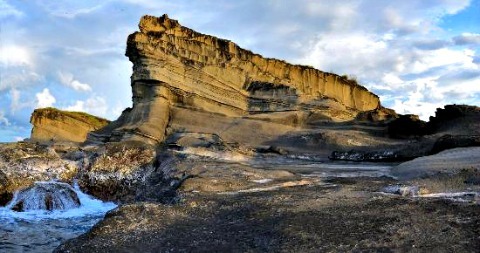 But up close, the unique Biri Island Rock Formation – all seven of them – has been carved to perfection. One resembles a towering tiger, the others formed like honeycombs, straight lines, Arabic writings on the rocks, one looks like Cloud-9 waves frozen in time and bizarre rock patterns. The bloggers call the rock formation as the “battle of the gods” since whipping winds, shakes from tectonic plates, fierce storms, heat wave and the huge waves blasting at the rocks created its magnificent beauty. Adding beauty to it are the white sandy shores that dotted across the formations, lush mangrove forest and crystal clear waters that one can see the corals and sea grass bed while crossing to the rock formations. The Biri Island Rock Formation is the icon tourist destination of the province of Northern Samar according to provincial tourism officer Josette Doctor. She said the iconic destination has always fascinated and mesmerized local and foreign tourists. The island was among the destinations during the Northern Samar leg of the familiarization tour last week dubbed as “Northern Samar Summer Fun” organized by the local government units and the Department of Tourism region 8 office (DOT-8) participated by media members, travel bloggers, tour operators and other tourism stakeholders. It was ranked fifth for two years in the online Search for the Top 10 Philippine Gems by Isla Lipana & Co.
“Amazing rock formations carved thousands of years,” Isla Lipana & Co. described the newest Philippine gem in its website. It was the only tourist destination in Eastern Visayas that figured in the list picked by the travel bloggers. The beauty of the island has charmed Canadian accountant John Ryan who was smitten by Glenda, a native of Biri and they finally settled in the island for the last seven years. “The laid-back lifestyle with wonderful people and an island with awesome rock formations, blue seas and rich marine life, how could you not love that? said Ryan. He later put up Glenda’s bed and breakfast to accommodate the influx of tourists coming to the island. Biri is an hour boat ride from the fish port in Lavezares town, Northern Samar. Lavezares is a six-hour land trip from Tacloban City, Leyte to Allen town in Northern Samar. Going to Samar means crossing the famous 2.16-km San Juanico bridge that links the island of Leyte and Samar. Along the highway, Amorsolo-like paintings of the rice-fields feast the eyes and the coastline of Samar and Northern Samar. From Allen, a passenger jeepney can take you to Lavezares. Those coming in from Manila can take a commercial flight to Catarman town in Northern Samar, which is just 20 minutes away to Lavezares. Those with an adventurous streak can take a 15-hour trip by bus from Manila to Matnog town in Sorsogon. They can then take a ferry to Allen before proceeding to Lavezares. Those from the Bicol Region can take a three-hour boat ride from Sorsogon to Biri. The best time to travel is between April and June when the waters are calmer. But for those who want to witness God’s amazing hands in sculpting the rock formations, anytime is the best time. Crossing from Lavezares to Biri is an experience by itself. One is advised to cross at early morning to avoid the rough seas. Three kilometers from the shoreline, an all white life-size sculpture of Nuestra Señora de Salvacion (the Patron for safe sea travels and of the town of Lavezares) saving a seaman in a sunken ship mesmerizes travelers. Biri Mayor Antonio B. De los Reyes Jr. said he sculpted the image of the Nuestra Señora de Salvacion in 2005 and donated it to the municipality of Lavezares. “The image has a powerful solar light in its forehead, to guide night travelers. I sculpted when I was a first councilor of Biri. Fortunately for all of the travelers crossing the ferocious seas, everyone arrives at their destination safely,” he said. The boat ride to Biri is bumpy but the anxiety disappeared upon seeing blue clear waters, white sands and the awesome beauty of the whole town and its people. These drivers of habal-habal (a single motorcycle that can accommodate 2 or more passengers also served as trek guides and as cameramen. It is advised to go to the rock formations during low-tide in order not to step on the corals and to have more time to explore. There are seven rock formations from the West going to the East. These are Magasang, Magsapad, Macadlaw, Puhunan, Bel-At, Caranas and Pinanahuwan. This island of warm and friendly people has a population of 10,982 in the 2010 census. The source of income of the people is fishing and copra-making. The place has been a favorite for retirees and foreigners who settled in the island in the last 10 years. Lately three anchors of big ship were discovered in one of the islets of Biri. They will present said discovery to the National Historical Cultural Commission to be declared as historical treasure. Tourists paid PHP50 each for the entrance and environmental fee. The collector recorded our payments in his log book said the money is used for maintaining cleanliness in the area and in paying the watchmen. Very cheap indeed. Since it was already high tide when we got there, the group was advised go to Bel-At and Caranas rock formations. The collector volunteered to return our entrance fees of PhP50 each. We appreciated such honesty, but we told him to keep it and added another P200 as out tip. Our habal-habal drivers that served as our trek guides brought us to Progress village, one of the 8 villages in Biri. Yes the Barangay is called Progress and progress indeed can be seen in the area. It was a smooth ride with cemented roads as we traversed 2-kilometers to the site. Other tourists opted to walk and jog to the area early in the morning. We walked through a wooden bridge painted in green that matched the lovely lush mangrove forests and coconut trees that abound in the area. The bridge spans a kilometer. We saw a slab of rock like a giant’s foot as we waded towards the Bet-Al formation. Boulders abound with secret walkways and natural swimming pools. After another ten minutes, the beauty of Bel-At and Caranas took our breath away. A magic wand seemed halted the Cloud 9 waves to form the Bel-At rock formation. Colored brown-orange, smooth edges and rugged lines intertwined. It is as huge as a cathedral. We failed to climb the top, but our guide told us, it has green grass and few trees. For enchanting destination like Biri, a legend has been told that there was a lovely woman called Berbinota who once ruled the place. It is from her that the town got its name said the old folks. That’s why the visitors are warned not to make noise when going to the 2nd rock called Magsapad that resembles like that of a tiger, but looking at the left side, the rock resembles like a beautiful woman with long flowy hair. This is said that Magsapad is the resting place of the goddess. When one caught her ire, strong winds and gigantic waves will splash at the area. Until this day, it remains a myth. Josette Doctor, provincial tourism officer said Biri rock formations is a playground for geologists and for ordinary people like us who thirst for the beauty in life. Two-day trip was not enough as we missed going to Macadlaw, Puhunan and Pinanahawan. We also missed going to the white beach of Mac Arthur village famous site for its surfing. There are a lot that can be done while in Biri. Tourists who love the water can go snorkling, scuba diving, surfing or just swim in the clear blue waters. Surfing is best at the white beach in Mac Arthur village. Photo enthusiasts can take photos of the rock formation and even the gigantic waves. Tourists can also do bird watching, camping, rock climbing and boating. Northern Samar is very rich and has mystique natural tourism resources - both environmental and cultural. The province is just spectacularly beautiful, awesomely endowed with splendor of nature, glory of history, and the nature of uniqueness of the local culture according to Rodel Canes Baliebare, Northern Samar tourism developmental manager.